Back in the day I started making a Plasma Wayland ISO to help people try out Plasma on Wayland. Then we started Neon and the obvious way to create the ISOs became through the Neon infrastructure. With Wayland becoming closer to be ready to use every day I’ve decided it’s time to scrap the dedicated Wayland ISOs and just install the Wayland session by default on the Dev Unstable ISOs. It’s not yet the default so to give it a try you need to log out, select Wayland session and log in again. Or install the ISO and select it at login (you’ll need to switch back to X to install, Calamares doesn’t run in Wayland because it wants to run as root which is verboten). Wayland is pretty much ready to use but the reason we can’t switch to it by default is mostly that some obscure graphics cards may not work with it and it’s hard to implement a detection and fallback for this. The fonts may be a different size due to differences in the screen dots-per-inch detection and middle mouse button selection paste doesn’t yet work. 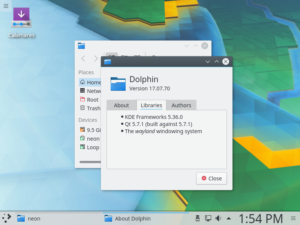 Grab the KDE neon Dev Unstable ISO now to try it out.